What is in your toolbox? Most of us have hammers and screwdrivers for repairs, and of course power tools—because nothing brings greater happiness than making a mess and generating a lot of noise. But did you know that God’s fingerprints can be found in our toolboxes as well? We can uncover amazing spiritual lessons tucked between our pliers and wrenches. Sometimes we act as if God is distant, but God glimpses are present in every aspect of our lives. We just have to look for them. Take a trip through thirty items in a toolbox and discover encouragement, inspiration, and confirmation that God is so close you can reach out and touch Him. Get powered up to live as a man of character and strength. What is in your jewelry box? A love letter, lock of hair, watch, or safety pin? Did you know that God’s fingerprints—evidence of His presence—can be found there as well? We can uncover some amazing spiritual lessons tucked between our pearls, earrings, and silver bracelets. Sometimes we act as if God is distant, but God glimpses are present in every aspect of our lives. We just have to look for them. Take a trip through thirty items in a jewelry box and discover encouragement, inspiration, and confirmation that God is so close we can reach out and touch Him. Be bling for the King. Look for God glimpses in your jewelry box and shine for Jesus. You can’t do better than my friends, Michelle Cox and John Perrodin, if you’re looking for spiritual guidance leading to real growth. When I think of them both, what comes to mind beyond their commitment to stellar writing and careful scriptural scholarship is a deep love for God and a reverence for His Word. Add to that their examples as spouses and parents in two long-term marriages, and you have a pair of authors uniquely qualified to mine the unsearchable riches of Christ. Immerse yourself in God Glimpses ... and come away more disciplined, consistent, and prepared to serve. Looking for a refreshing reminder of your place in God’s Kingdom? Then this is the book for you! In God Glimpses from the Jewelry Box: Becoming Jewels God Can Use, Michelle Cox and John Perrodin wrap spiritual truth around ordinary items found in jewelry boxes. Beckoning titles such as “Broken Jewelry,” “A Pet Collar,” “Diamonds” and “The Charm Bracelet,” invite readers to ponder their own treasured status. In addition to poignant stories, each of the thirty chapters contains an encouraging quotation, prayer and Scripture — and ends with the thought-provoking Jewelry Insurance Inventory Form. From the time I was a tiny girl, I had a fascination with jewelry. I spent hours going through both my mother and my grandmother’s jewelry boxes — each piece telling a story. Michelle and John have captured just that, the reminiscent feeling of pouring through those boxes. I will not be able to look at my own jewelry box the same. 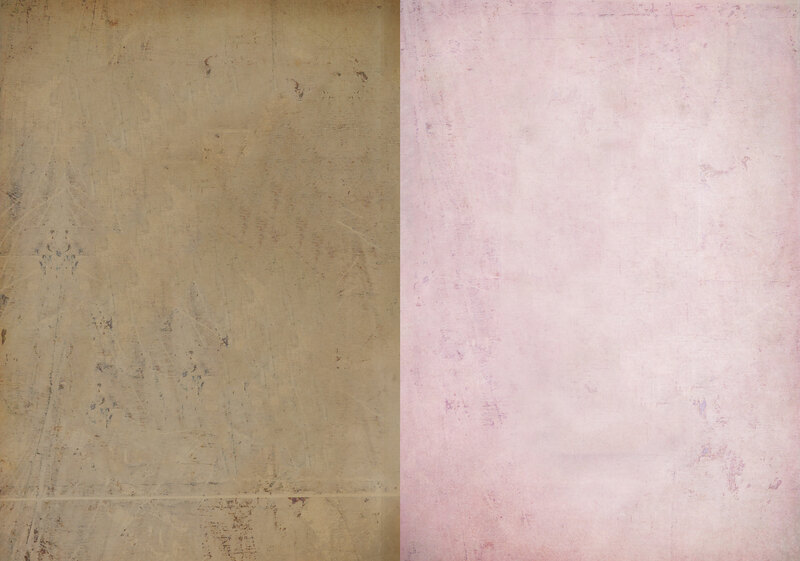 Instead of the glitz and bling, I now see the fingerprints of God and my life story. This book will be my go-to gift for all my girlfriends. This is a “curl upon the couch with a cup of coffee” feel-good book. Now I’m going to accessorize, accessorize and sparkle for Jesus! Carol Hatcher is a sassy, southern, sparkly boot-wearing wife and mother of three. A writer and international speaker, she passionately shares her love for Christ by serving others and encouraging everyone to become an Everyday Missionary. 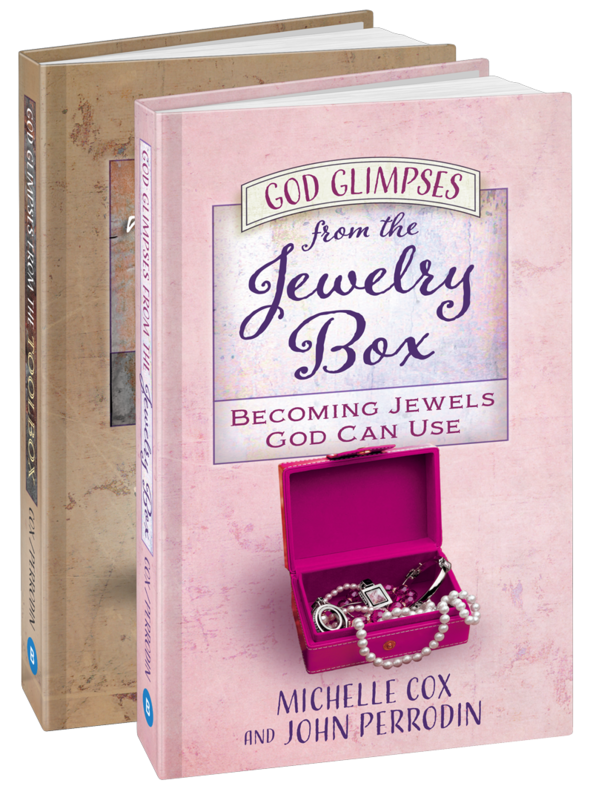 My friend, author Michelle Cox who wears “bling for the King,” has written a sparkling new devotional “God Glimpses from the Jewelry Box” that will perfectly fit anyone who loves to shine! Dig in and discover the treasures that are sometimes hidden under tarnished heirloom silver, or the tossed aside strand of priceless pearls. Though you wear your charm bracelet every day, did you ever think of each charm as a memento of God’s faithfulness? Cox takes us through thirty different kinds of jewelry, inserting fascinating stories and prompting us to ask questions of our heart and soul in the process. Who knew that a pocket watch and earrings could spur us on to greater commitment to God who is the Creator of all true jewels? I greatly enjoyed this devotional and highly recommend it for those like me who fill half our luggage with statement necklaces! We built our home so we have tools upon tools we used to build a strong and stable home. That same plethora of handy tools is exactly what John Perrodin and Michelle Cox have placed in God Glimpses from the Toolbox: Using Tools to Build Men of Character. Having three sons and a grandson, this book is exactly the kind of toolbox every guy needs to hammer together a sturdy and well-built future. Authors of 45 books including "7 Simple Skills for Every Woman" and "7 Simple Skills for Every Man"
If there is one thing I hold dear in my heart, it's the heirloom jewelry in my jewelry box ... not necessarily for the monetary value, but because of the stories my mother shared with me as she showed them to me, back when they took up residence in the velvety recesses of her own jewelry box. But even more important than the jewelry passed down from great-great grandmothers, great-aunts, grandmothers, and my own mother is the legacy of being a woman after God's heart, which they also passed on to me. 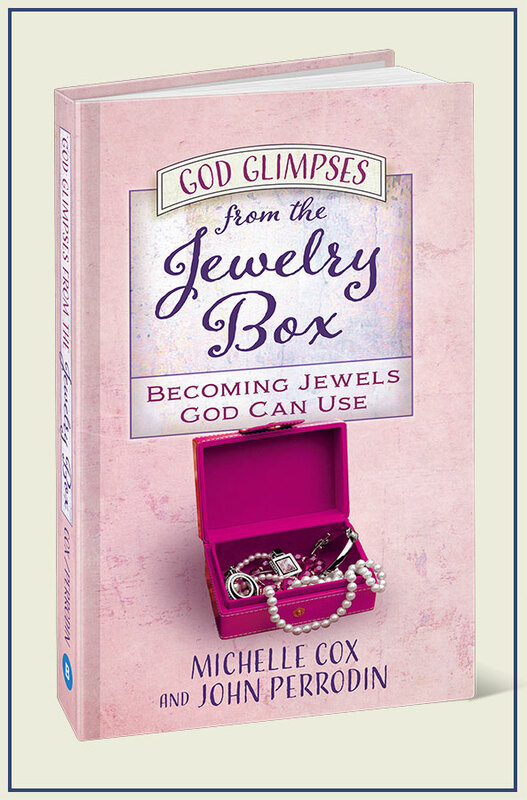 Within the words of this book, Michelle Cox has brilliantly woven the joy of the bling with the truth of the jewels, and the high value of God glimpses from the jewelry box. What a clever idea! I like the use of “manly" stuff as a way to illustrate our relationship with God. In the time it takes to choose and put on your jewelry, Michelle Cox and John Perrodin will inspire and encourage your walk with God. In God Glimpses from the Jewelry Box: Becoming Jewels God Can Use you will gain gems from God's word that will enlighten and energize each and every day to create a priceless future. As an avid do-it yourselfer, I have acquired an extensive array of tools in my toolbox. 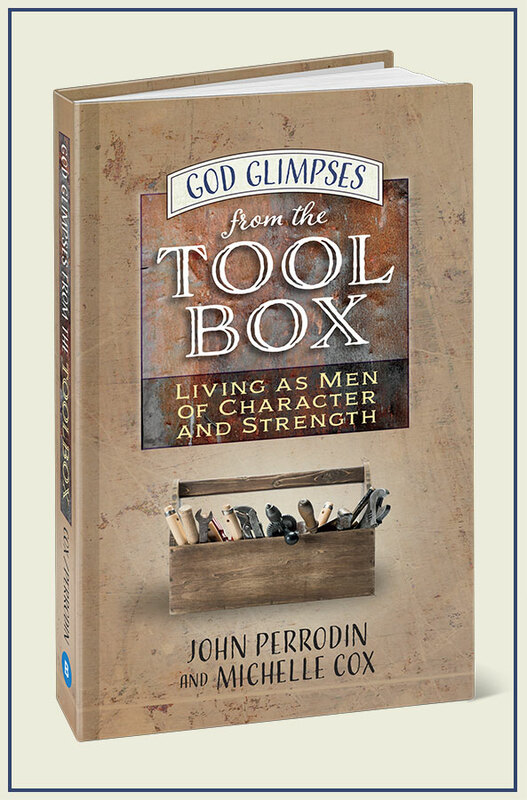 I however, never imagined that there was a whole new way to look at my toolbox until I read God Glimpses from the Toolbox: Using Tools to Build Men of Character. Reading this book has shown me that just as I am careful about using the proper tools when doing improvements to my home, I need to equip myself with the proper spiritual tools as well as know how to correctly use them if I am to make much needed improvements to my spiritual home. What great lessons I learned and can now apply to my life through this marvelous book! Excuse me now as I go plan my next do-it-yourself project. God Glimpses from the Jewelry Box is a lovely collection of devotions designed to help readers find the jewels hidden in everyday life. I especially like the "Jewelry Insurance Inventory Form” at the end of each chapter that asks readers to consider where their treasure is, and encourages them to store up treasures in heaven — those that will never lose their value. A jewel of a book! Move over Bob Vila! Whether you need a spiritual gut-rehab, remodeling or plain old preventive maintenance, you'll need this toolbox by your side. Michelle and John have nailed down practical, easy-to-read blueprints for a man's spiritual growth. Of course we are all "fixer-uppers," but when it comes to spiritual property value for Christian men....location, location, location is still what matters most....your heart. Psychologist, Assistant Clinical Professor at Harvard Medical School, and author of "The Winner's Brain" and "The Runner's Brain"
Catching a glimpse of God is one of the great joys and encouragements in our daily walk with the Lord. I’m so glad Michelle and John wrote the “God Glimpses” books. It’s a brilliant concept - stuffing jewelry boxes and tool boxes with clever concepts to enhance our relationship with God. To download a sample of God Glimpses from the Toolbox and God Glimpses from the Jewelry Box, insert your email below. 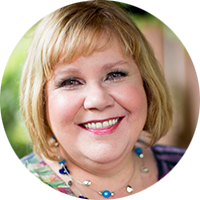 Michelle Cox is the award-winning, best-selling author of nine books and the creator of the Just 18 Summers® brand of parenting products and resources. She and her husband live in the mountains of North Carolina. 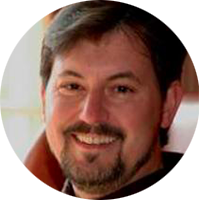 John Perrodin is an attorney, speaker, and journalist, who wrote 3-Minute Devotions for Grads and contributed to various devotional volumes including The Spirit Calling. He lives with his wife and children in Colorado. Buy "God Glimpses from the Toolbox"
Buy "God Glimpses from the Jewelry Box"